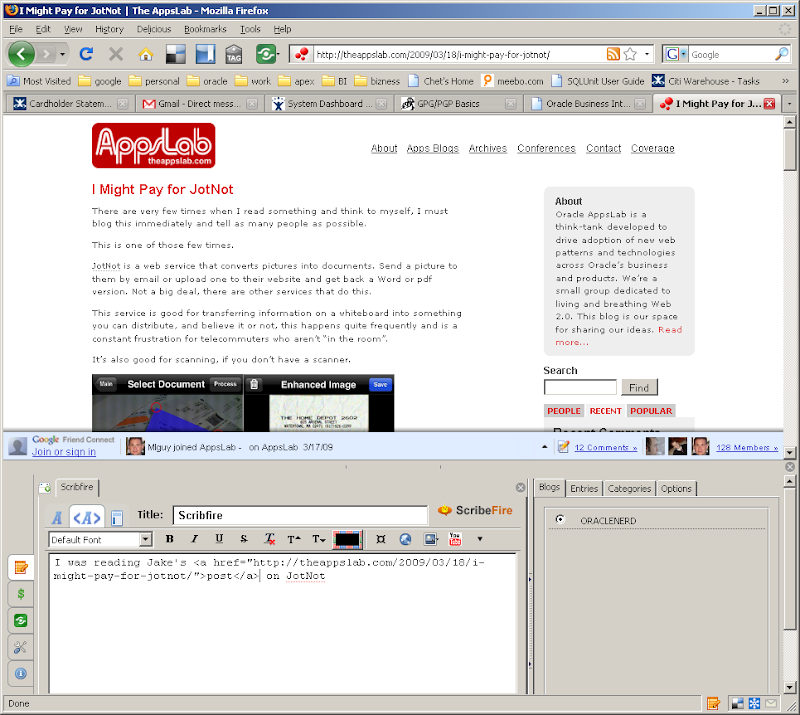 I was reading Jake's post on JotNot and somehow I came across ScribeFire, a FireFox add-on. I'm thinking man, this is very cool. I looked at the version number, 3.2. Hmmm...maybe I'm not really an early adopter here. Google for it and found this post which describes some of the functionality. The thing I like best about it is the split window. As I'm linking stuff up I have to do either Alt+Tab to switch windows (work) or Ctrl+Tab to shift tabs (home). Yes, I still write my posts in the source view. I like ScribeFire so far and will try it out for a few posts. I have ScribeFire installed (h/t Rich), and I used it for a while. It supports multiple blogs, which is nice. Problem for me, it didn't stick as an everyday blogging tool. Not sure why, I guess I prefer writing in WP directly. You should check out posterous, just send it email and voila, blogging made simple. It does embed magic for you too on pics, videos, etc. It's already worn out it's welcome because I couldn't preview the post. It pulls up my page, but not with the content I'm currently writing. A tad annoying. Everything else I do like though and this might just be a configuration issue that I missed. I'll check out posterous as well. gratzi! I think it very much depends on what you are blogging. I live for Scribefire when I do shorter posts, just a link and a few sentences. I wouldn't, for example, use it if I was writing something like a movie review or longer. I find the preview works to my needs, but there does appear to be something funky about how it handles blockquotes so I invariably have to go into code-view and adjust things. Good point about the shorter posts. I don't have to abandon it altogether.